In 2002 I was visiting my husband in New York and we decided to have dinner at a fancy Italian restaurant with his schoolmates. I forget the name of the restaurant but will never forget reading the menu and feeling a sense of anxiety. For one thing, everything seemed so expensive compared what I was used to, so I decided to order a pasta dish which seemed cheaper than having a main. My cause for distress was from wanting to order something I’d never heard of before, the Pumpkin Gnocchi. I hated eating my veggies as a child. I remember having dinner every night with the family and how my parents would insist that no one could leave the table until all our vegetables were finished. I knew of course this vendetta was solely targeted at me as my sibling never had the same aversion. More than once I was forced to sit by myself, long after everyone else had left the dinner table, to finish my food. Once, I was so desperate that I decided the only way I could finish the spinach on my plate was to shred it into tiny tiny pieces and swallow it with big gulps of water. I tell you, I had tears down my face as I gulped down at least three glasses of water just to finish my meal. Sometime after that I discovered a way to outsmart my parents and this involved me pretending to swallow my vegetables but secretly spit it out in a serviette. It seemed to work for a few months until I was found out and then had to resort back to the “swallow the veggies” technique again. Looking back, I’m sure I had this notion that all vegetables tasted horrid and bitter and there was no way I would ever, EVER grow fond of them. Now I realize that it’s all about how vegetables are cooked and served. Give me boiled spinach today and I’ll resort to a number of ways to dispose of it as in my youth. 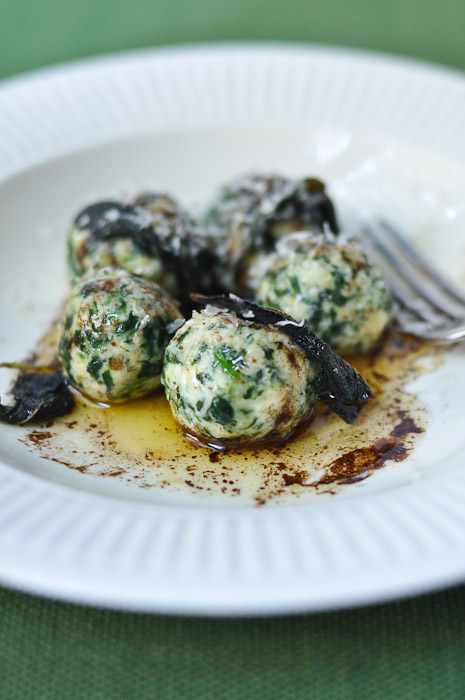 But serve me spinach enveloped in a cloud of ricotta and parmesan, served with a browned butter and balsamic sauce and I guarantee you a clean plate! 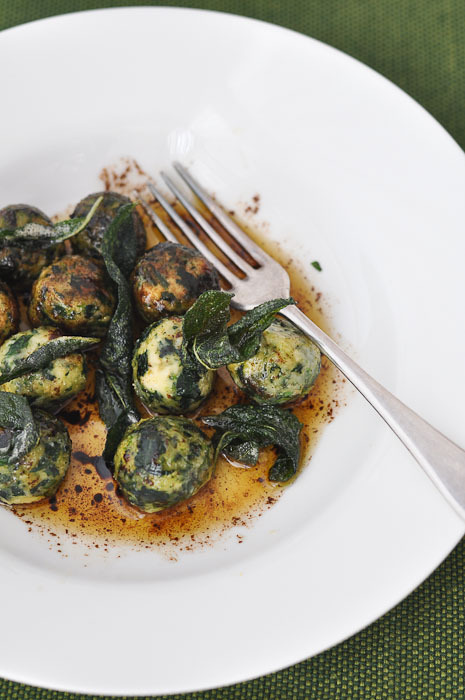 Gnudi (Nu-dee) are dumplings, very similar to gnocchi but usually made with ricotta cheese. 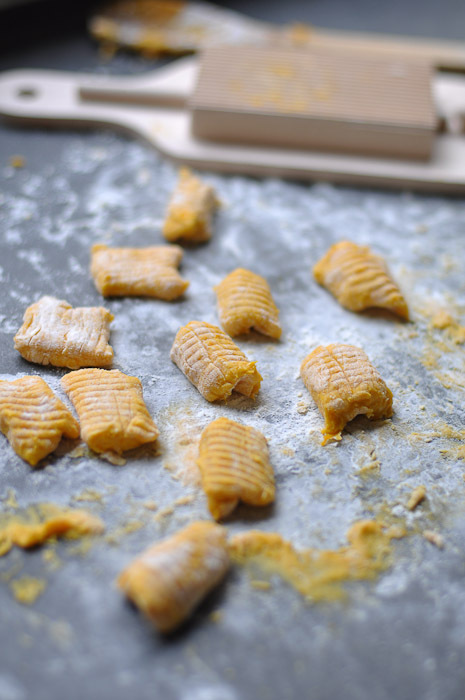 Other sources think of it as a ravioli or tortellini without the pasta dough around it, hence the name gnudi (naked). The inspiration for making this dish came one day from a twitter conversation where I asked what I should make for dinner. 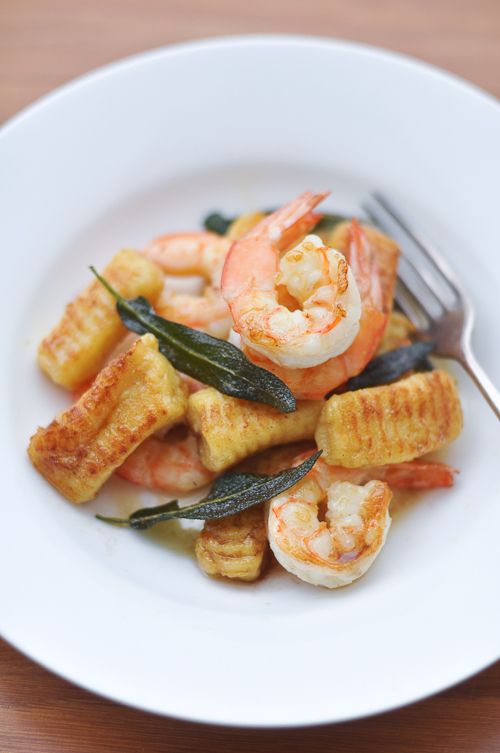 One suggestion led to another and then I remembered a recipe I saw for Gnudi for the Australian Gourmet Traveller website. I have changed the recipe slightly (1) I used baby spinach rather than the three bunches of english spinach called for – I found it easier to use the ready washed packets of baby spinach leaves you can easily get in the grocery (2) I used two eggs instead of an egg and two egg yolks – because I would have had no use for the two egg whites and (3) I added some balsamic vinegar to the sauce which cut down nicely on the richness of the ricotta and butter. Overall, this is a fantastic dish and I can see myself making this many times going forward… and it’s a dish that I’m pretty sure even vegetable-hating kids would enjoy! Blanch the spinach in salted boiling water for around 5 to 10 seconds and then refresh in a bowl of iced water. Drain the spinach leaves and squeeze as much liquid as you can from the leaves. When I drained the spinach leaves the weight came out to 125 grams. 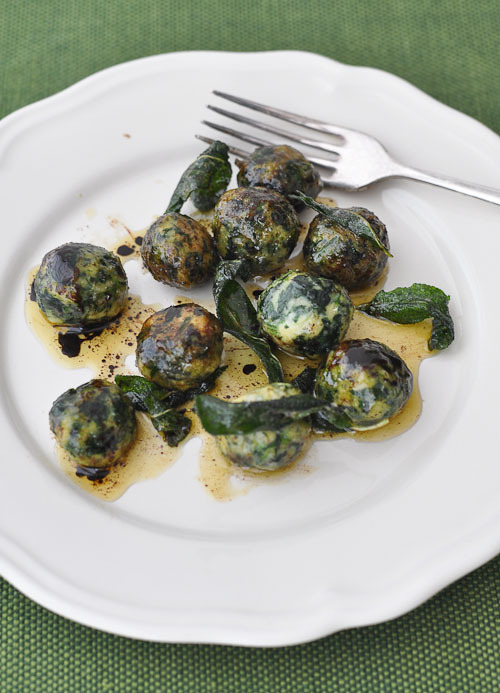 In a bowl combine the ricotta, spinach, eggs, parmesan, nutmet, flour, salt and pepper then roll into walnut sized balls. Refrigerate the gnudi balls for around 20 to 40 minutes until well chilled. Bring a large saucepan of salted water to a boil and then reduce to a simmer over medium heat. 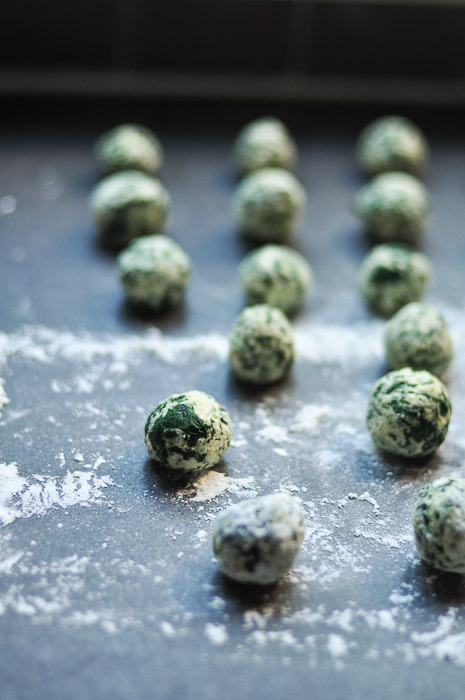 Roll the gnudi balls in flour and shake off excess. Drop the gnudi into the salted water and cook until the gnudi start to float to the surface. 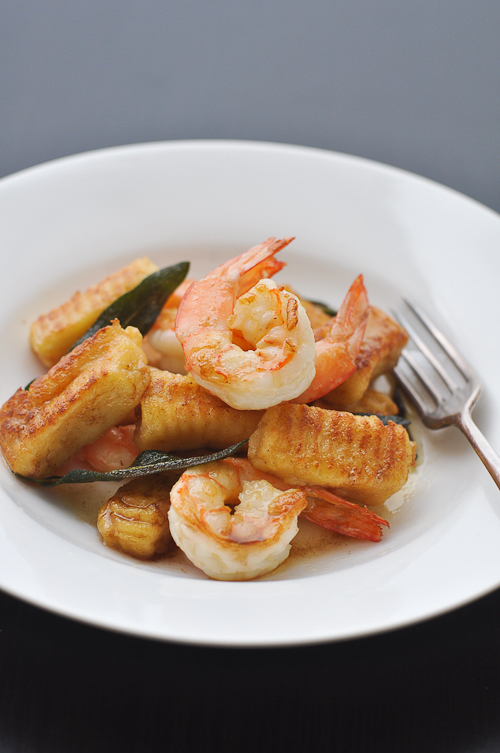 This will take around 2 to 4 minutes and then carefully remove the gnudi using a slotted spoon. Drain on absorbent paper and keep warm. Meanwhile, heat the butter in a frying pan until foaming and browned. Add the sage leaves and cook until crisp, around 1 minute. Be careful not to burn the butter. Finally remove the butter off the heat and add the balsamic vinegar. Serve immediately with more parmesan cheese.